Fonda Speedway’s new BD Motorsports Media LLC management team and DKM Fabrication have joined forces in a marketing partnership for the ‘Track of Champions’ 2019 season. Located within earshot of the speedway in Fultonville, N.Y., DKM is a movement and a 100-percent in-house racecar company that is disrupting the way dirt Modified chassis are designed and built. DKM leverages its advanced engineering knowledge and use of state-of-the-art technology to design the fastest cars available on dirt. The DKM background of founders Dave Constantino, Eric Mack and Kyle Hoffman stems from a deep technical understanding of dirt oval racing and a meticulous obsession with quality. DKM-built cars of the ‘Black Flag Crew’ were regular visitors to Fonda’s famed checkerboard square during the ’18 season. Since taking the lease of Fonda’s half-mile oval in November, the new management team has ‘disrupted’ dirt Modified racing in the region with strong, well-balanced pay structures, innovative ideas and the resurrection of the Fonda 200 paying $53,000 to win in September! DKM and Fonda have joined forces for a ‘Black Flag Section’ of the speedway’s grandstands located in turn four. 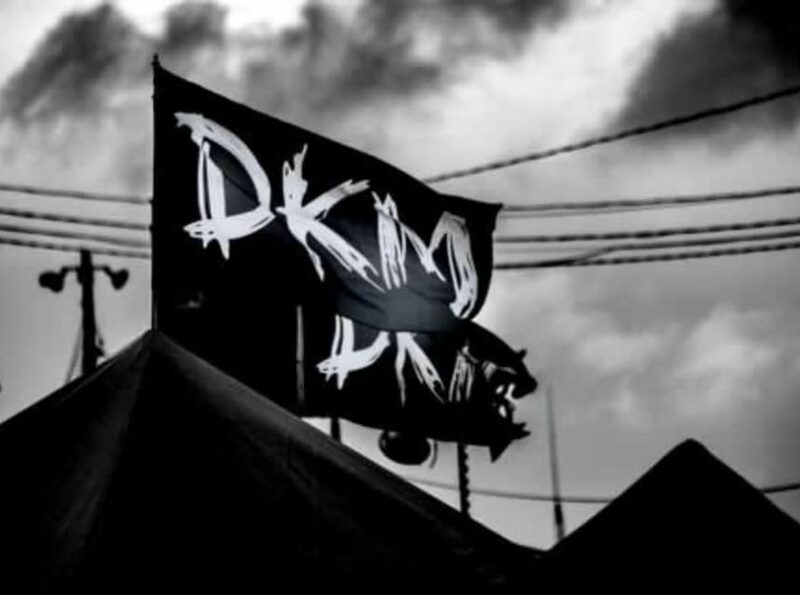 Fans watching the action from the ‘Black Flag Section’ will enjoy special promotions and giveaways regularly courtesy of DKM. The ‘Black Flag Section’ will be marked with DKM flags in the air and signage throughout. To learn more about DKM, visit www.dkmracecars.com, “like” DKM Fabrication on Facebook or subscribe to the DKM Fabrication YouTube channel. Call 518.441.5026 to order a DKM Cyclone Chassis today. Fonda Speedway gets the green flag on Saturday, April 13 with Open Practice for all divisions. 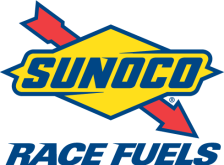 The official Season Opener is planned for Saturday, April 20, featuring Sunoco Modifieds, Crate 602 Sportsman ($1,000 to win by Eric Orozco Racing), Pro Stock American Racer Best of 8 Series ($800 to win), Limited Sportsman and Trackside Body Works Street Stocks. Since 1953, the ‘Track of Champions’ Fonda Speedway has hosted the best in stock car racing. 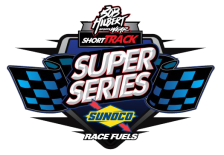 Now under the management of BD Motorsports Media LLC, the speedway will operate weekly on Saturday nights from April through August plus several special events. Fonda Speedway is located on the Montgomery County Fairgrounds off New York State Thruway Exit No. 28 at 21 S. Bridge Street Fonda, NY 12068. Fonda Speedway is on the web at www.thefondaspeedway.com. 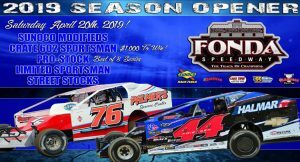 To learn more, call the office at 518.915.4395, like Fonda Speedway on Facebook www.facebook.com/thefondaspdwy or follow on Twitter: @thefondaspdwy.